Elaine Chappelle is the better half of a man who talks for a living. There is information readily available about Elaine’s husband, Dave Chappelle who is a successful American stand-up comedian, actor, writer, and producer, but not much is known about the woman behind his success. A lady that values family above all else, Elaine gave up some of her life goals, choosing instead to work behind the scenes for her soulmate. Find out amazing facts about Elaine Chappelle whom despite some forgone opportunities, is considered a role model for many other women. Elaine Mendoza Erfe is a New York native born on August 31, 1974. She is of mixed ethnicity as her parents are Philippinos who migrated to the US in search of greener pastures when Elaine was still a baby. There is a scarcity of information regarding her parent’s identity, early life, family background, and education. 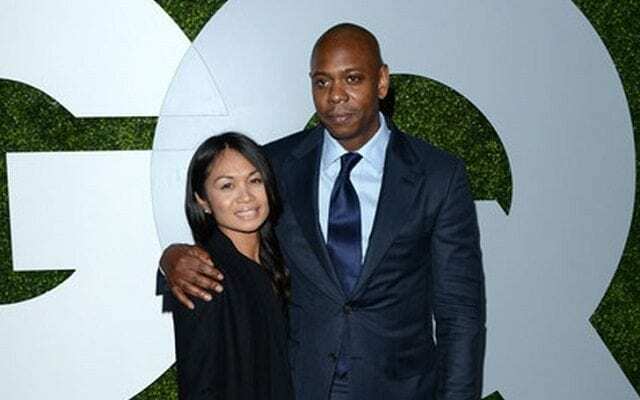 Elaine is happily married to her longtime partner Dave Chappelle. The couple has been together for nearly two decades and has an interesting love story. Before she met her heartthrob, Elaine lived a low profile lifestyle. Dave Chappelle’s wife wasn’t such an easy catch for her husband as she initially did not want to fall for the comedian who was already used to the spotlight. But Dave apparently had the key to Elaine’s heart and it wasn’t long before love conquered for the couple. Elaine and Dave exchanged marital vows in the year 2001. In fact, many were unaware that the couple was already married until they made their first public appearance together during the annual Philippines-American picnic in Dayton, Ohio. The couple has since expanded their family and are proud parents to three children – two sons Sulaymana and Ibrahim and a daughter Sonal. Elaine Chappelle and her husband Dave are a unique couple and of liberal minds. While they were both raised as Christians, Dave made the life-changing decision to convert to Islam shortly before their marriage. On the other hand, his wife has clung to her Christian faith since their marriage. The couple is not just comfortable practicing their different religions but they also respect each other’s beliefs. More so, the close-knit couple has often been regarded as role models for bi-racial couples. Elaine once revealed that she nurtured dreams of becoming a chef while growing up. But after her marriage, the passionate homemaker preferred to use her culinary skills solely for her family. In fact, her husband has publicly praised her cooking talents, stating that though Elaine is not a professional chef, she always treats her family to delicious and exquisite meals of royal standards. Elaine Chappelle currently lives with her family in a 65-acre ranch in Yellow Springs, Ohio. The homemaker loves the property not just because it is relaxing and surrounded by cornfields but also because it has become a home that holds good memories for her family. Some fans may wonder what it is like to be the wife of a comedian. A supportive wife, Elaine and her kids are part and parcel of Chappelle’s comic career. Dave is known to often make fun of his wife and kids at shows. While people have been curious to know if his family are cool with his comic style, Elaine has at various times stressed that she has no problem with her husband’s job and sense of humour. In fact, in 2017, Dave who loves and adores his wife dedicated the entire Hollywood Palladium show to Elaine. In 2005, Elaine’s husband was the topic of a drug-related controversy. It was during this period that Dave was grieving for his father’s death and in order to heal better, the comedian decided to take a brief hiatus from work and travelled to South Africa. However, Dave’s decision was misinterpreted by the media as many alleged that the comedian was a drug addict that chose to heal on drugs rather than with his loving family. Appalled by the allegations, Elaine supported her husband’s decision to grieve on African soil and also encouraged him not to pay attention to the nasty speculations. Through their highs and lows, love has conquered for the couple and they remain strong and supportive of one another. Elaine Chapelle’s height is complemented by that of her husband Dave. The homemaker and housewife stands at a height of 5 feet 4 inches and weighs about 55 kg. While her other body measurements are unknown, it is safe to say she has maintained a good physique over the years even after three children. Elaine Chappelle’s earnings are unknown but being a supportive wife over the years, she is presumed to share her comedian husband’s fortune. She co-owns and manages most of David’s assets scattered across Ohio and her financial value is pegged in millions.